LA MESA (6-23-14)  Helix Highlander lineman JAYLON KUYKENDALL has accepted a scholarship to Northern Arizona University at Flagstaff , Ariz. The 6-foot-1, 300 pound senior-to-be elected to sign early in accepting the Lumberjacks offer. Kuykendall was selected to the 2013 All-East County Sports.com first team as an offensive lineman. In selecting NAU Kuykendall turned down offers from San Jose State , UNLV and USD. One of the eye-catching features for Kuykendall was the NAU Skydome. In 2012, the J. Lawrence Walkup Skydome, one of the most unique venues in all of college athletics, celebrates its 36th year as the entertainment center for northern Arizona . The Skydome has been the home of NAU football, basketball and indoor track and field since 1977. Kuykendall, who will play either guard or center for the Lumberjacks, admitted being amazed by the Skydome. He visited NAU a week ago and was impressed onsite. The Skydome just catches your eye right away, and when I talked to the coaches it just made everything even better, said Kuykendall, who has a 3.2 GPA. He plans to major in psychology. EL CAJON (6-22-14)  The Grossmont Conference has shuffled teams between the Grossmont Hills League and the Grossmont Valley League for football only for the 2014 season. The East County leagues will have a new alignment with two major changes in each league, instead of the anticipated one or two schools switching. The lineup for the Grossmont Hills League shows El Capitan and Mount Miguel joining Grossmont, Helix, Steele Canyon and Valhalla. In the Grossmont Valley League, the new lineup shakes out with Granite Hills and West Hills joining El Cajon Valley, Monte Vista and Santana. The teams will open the season on Friday (Aug. 29) in non-league contests. The only exception to the first round schedule will be Helix battling Ventura's St. Bonaventure at Cathedral Catholic at 8 p.m. on Sat., Aug. 30. EL CAJON (5-13-14)  Versatile Grossmont High senior J.T. BARNES will attend San Diego State in the fall. The 6-foot-3, 200-pound Barnes will specialize as a wide receiver and a kicker. He turned down scholarship offers from Northern Arizona and USD to join the Aztecs. J.T. was an outstanding student-athlete at Grossmont High and is a great example to our younger players, said Foothillers football coach TOM KARLO. J.T. chose SDSU because he likes the school and the opportunity to play Division I football. Barnes broke seven school records in receiving and kicking. He had 117 career catches for 1,435 yard and 21 touchdowns. He booted 121 extra points and registered a total of 256 points. He was first team All-East County as a senior and All-Grossmont Hills League in his final year. Following his final seaso,n Barnes was an NSFF scholar-athlete award winner. ALCALA PARK (4-22-14)  West Hills High kicker DANIEL McMANUS has accepted an invitation to play football next fall at the University of San Diego . With a 4.20 grade-point average, the educational opportunity at USD is the most appealing consideration, according to McManus, who plans on studying Engineering. This year, McManus was named Second Team All America by one major wesbite. In addition he was First Team All State by CalHi Sports, First Team All CIF San Diego Section, First team All Grossmont Hills League for the second consecutive year, and East County Sports.com Kicker of the Year. He was aso Second Team All-Grossmont Hills League as a wide receiver. 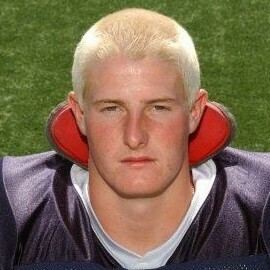 In 2012, McManus earned 1st team All EastCountySports.com and Grossmont Hills League Kicker of the Year. He made 7-of-10 field goals with a long of 38. He was 37 of 40 PATs. SIOUX CITY, Iowa (4-16-14)  NOAH ORTIZ, tight end-wide receiver-outside linebacker for West Hills High has committed to NAIA Morningside College. At West Hills Ortiz had 21 receptions for 270 receiving yards and rolled up 300 all-purpose yards. In addition he scored 18 points (3 touchdowns), notched two sacks and had an interception for the Wolf Pack. Morningside was in the National Championship in 2012, losing in OT 30-27. The Mustangs are 101-21 for a .828 winning percentage since 2004, and started last season ranked No.1. 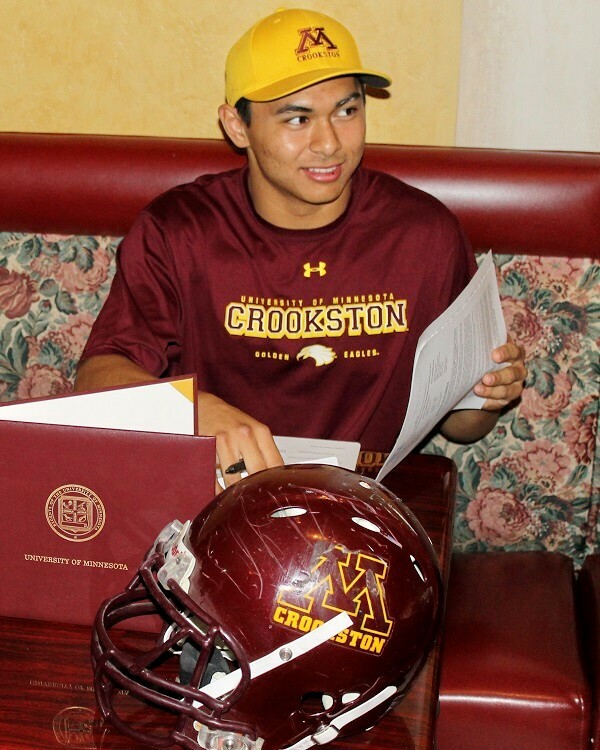 EL CAJON (3-9-14)  Versatile West Hills High defensive back ALEJANDRO PEANUT HERRADA has signed a national letter of intent with University of Minnesota-Crookston (NCAA Div. II). Herrada follows in the footsteps of Wolf Pack alumni ERIC FIEGE and DOMINIC LaRUSSA in playing for the Golden Eagles. Herrada was on the first team defense All-East County Sports.com team for 2013. Valhalla defensive back ISAIAH EDWARDS has signed a national letter of intent to attend Western New Mexico University. He follows his elder bothers MICHAEL MAYE (Cal Poly SLO) and JOSH EDWARDS (UCLA), both of whom were East County standouts at Monte Vista (class of 2003-04). EL CAJON (2-18-14)  Grossmont High quarterback ANTHONY LAWRENCE could have gotten caught up in his record-breaking stats, but did not do so. Anthony Lawrence signs with USD. Although he is the San Diego Sections all- time leader in passing yards, completions and Touchdowns, Lawrence was not awarded a Division I football scholarship. He could easily have been disappointed, but denies it. This is the perfect setting for me, said Lawrence, who signed on to play football with the University of San Diego , an NCAA 1-FCS institution. Of course, he could qualify for an academic scholarship at almost any school in the nation with his 4.3 grade point average, whether he played football or not. I got a Merit Scholarship, which is the best USD gives out, he said. Lawrence established himself as the most prolific passer in San Diego CIF history, passing for 9,079 yards over his three-year career. He also hurled 96 touchdown strikes and completed 691 of 1,099 passes in 36 games. Although known mostly for his passing, the 6-foot-2, 198-pound Lawrence also proved that he can scramble as he collected 750 yards and 10 touchdowns rushing. Several other universities were attracted by his academic excellence as well as his athletic prowess. One of those that was highly interested in Lawrence was the University of Pennsylvania of the Ivy League. And did anyone say anything about freezing? Thats been the daily forecast for Penn and its not even football season yet. Lawrence will play for offensive coordinator and West Hills alum, TANNER ENGSTRAND, a former teammate of Karlos at Grossmont College . Engstrand was at the front leading the charge for one of the most productive and explosive offenses in the Football Championship Subdivision (FCS) in 2013. Karlo is pleased that Lawrence was a double success, both in the classroom and on the field. Thats how he got where he is, the coach said. Asked if he thought he could make a career of professional football, Lawrence replied, Its dreams and aspirations to play as far as I can." SANTEE (2-14-14)  CASEY ASH is returning to West Hills for his second stint as the head coach of the Wolf Packs football team. Ash, 35, spent three seasons in his first tenure as leader of the pack, posting a Grossmont North League championship in his first year (2007) and an overall record of 14-17-1. So why did Ash leave the first time? Not that he gave up coaching. He spent three seasons at Del Norte and eventually became the offensive coordinator. For a defensive coach that was valuable experience because I was on the offensive side of the ball, he said. After that he joined Helix coach TROY STARRs staff and coached the receivers for a year. I learned a lot from Coach Starr and I feel like Im a lot better coach than when I was first head coach at West Hills at 29, Ash said. The Wolf Pack will compete against Santana, Granite Hills, Monte Vista and El Cajon Valley in the realigned Grossmont Valley League next season. No longer will the Pack have to compete for a championship against the realigned Grossmont Hills League teams of Helix, Grossmont, Valhalla, Steele Canyon , El Capitan and Mount Miguel . He pointed to the Wolf Pack underclassmen as his future. Former West Hills head coach TAY SNEDDON, who guided the Wolf Pack for three years, has joined coach SCOTT LONGERBONEs staff at Steele Canyon. | EL CAJON (2-5-14)  Seven more East County seniors have signed scholarship offers on Wednesday (Feb. 4), bringing the total to 10 thus far. All-State teams Tuesday (Feb. 3). From Steele Canyon, slotback LAWRENCE DICKENS will attend Marist College in Poughkeepsie, N.Y., to play for the NCAA Div. 1-FCS Red Foxes. Lineman CHANDLER ROGERS, also from Steele Canyon , will serve as a long snapper at the University of San Diego (NCAA Div. 1-FCS). He has a 4.8 grade-point average  third best in his class. Cougar corner XAVIER GOODLOE, another Steele Canyon alum, will attend Western New Mexico University (NCAA Division II), coached by West Hills High/Grossmont College linebacker ADAM CLARK. DAVID DILLARD, 6-foot-4, 300-pound offensive lineman from Mount Miguel is also going to Western New Mexico (NCAA Div. II). Valhalla wide receiver J0HN TODD has signed with Humboldt State University (NCAA Div. II). A 5-foot-9 160-pound receiver, Dickens caught 37 passes for 816 yards and 8 touchdowns in his senior year. He also returned 14 passes for 380 yards and a score, and rang up 1,426 all-purpose yards. Marist College, which also graduated Fox News commentator Bill OReilly, finished 8-3 a year ago. The 6-foot-2, 180-pound Goodloe played only one year of high school varsity football, according to Cougars head coach SCOTT LONGERBONE. Goodloe earned All-East County honors and returned 21 punts for 339 yards last season. Dillard, who was an All-East County pick and a first team Grossmont Valley League choice, will also move to Silver City, N.M., to play for the Mustangs. Its not very often that a long snapper gets a scholarship, but one with a gpa that ranks third in his high school senior class definitely gets attention. Rogers selected USD over Willamette among others with plans to major in engineering. Todd, a 6-foot-3, 182-pound All-East County wide receiver, caught 56 passes for 917 yards and 8 touchdowns. Perhaps the swing vote for him in the scholarship derby was in the 2013 Football Night Lights football game, where he caught 4 touchdown passes, including the game winner. Grossmont Highs record-breaking quarterback ANTHONY LAWRENCE has yet to make a decision on his future. The main focus of his attention is the University of Pennsylvania of the Ivy League and the University of San Diego . More scholarships are sure to come down the road. LA MESA (2-5-14)  Three Helix Highlanders will sign national letters of intent on Wednesday (Feb. 5). Multi-purpose standout JALEN DAVIS will cast his fate with Utah State, while linebacker RUEBEN LEASAU will sign with San Jose State, and offensive lineman JALEN WYATT will remain closer to home as he inks a pact with Azusa Pacific University. The 5-foot-11, 170-pound Davis should be a nugget for the Aggies, who knocked Northern Illinois University in the Poinsettia Bowl 21-14 in December 2013. Although Davis can play five positions, his specialty was as a return man. He returned 17 punts for 348 yards and 4 touchdowns for the Highlanders, and was almost as good at bringing back kickoffs as he returned 10 for 379 yards and 2 touchdowns. As a slotback Davis caught 48 passes for 649 yards and 4 touchdowns. As an all-purpose standout he accumulated 1426 yards. Davis, the Grossmont Hills League defensive player of the year also made first team All-EastCountySports.com as a corner. In addition, he shared co-defensive player of the year honors with Mount Miguel s DEVAUGHN MURRAY (SDSU) for the All-EastCountySports.com team. A 6-6 record and being left out of a bowl game apparently wasn't enough to keep San Jose State from thriving during the recruiting season. One of those who followed the Spartans recruiting flow was Leasau, a 6-foot-2, 210-pound linebacker who also played tight end for the Highlanders. Coach Ron Caragher's first full recruiting class stands to be one of the best in the Spartans history. Fresh off of a 10-2 record in its second season of NCAA-Division II football, the Azusa Pacific Cougars are starting to yield the fruits of success when it comes to recruiting. Locally, one of their latest recruits is Wyatt, a 6-foot-3, 250-pound tackle. Wyatt was a first team All-East County Sports.com offensive lineman last season. The Cougars are expecting to haul in a banner class on Wednesdays National Signing Day, and it could go a long way toward fueling the programs meteoric rise. LAKESIDE (1-30-14)  Four El Capitan High seniors are going to Australia just after graduation to play football in the 26th annual Down Under Bowl in June. They will play on the Western Conference Football Team in this annual all-star encounter..
El Capitan graduating seniors CHRISTOPHER PEARSON, WYATT ALVAREZ, SCOTT ROOT and DYLAN RETTIG will be making the once-in-a-lifetime trip, and are seeking sponsors to help defray costs. They were spotted by the Western Conference recruiter for Down Under Sports, with locations in the USA (including chapters in California and Hawai'i), Australia and New Zealand. Root caught 43 passes for 968 yards and 12 touchdowns in his senior season. Pearson caught 42 passes for 767 yards and 7 touchdowns. Rettig, who played a variety of positions, caught 22 passes for 281 yards and a touchdown. Wyatt was a second team All-Grossmont Valley League defensive back. There are four conferences from the U.S. playing in Australia . The Vaqueros will play teams from Australia, New Zealand and Hawaii . They will be there for nine days, competing from June 28 to July 6. The event will culminate with a Super Saturday Championship on July 5th. The games are played under National High School Federation rules and are officiated by USA and Australian officials. For more information see www.downundersports.com. To contribute to the trip sponsorship, contact Karen Davis at (334) 614-1394. The El Cap quartet follow former Vaqueros gymnast LORIANNA LOMAX who participated with Down Under Sports last summer. SANTEE (1-20-14)  For the fourth time in six years, West Hills High is seeking a new football coach. TAY SNEDDON, who posted a 17-17 record in three years, including 8-4 last season, has parted company with the Wolf Pack. No reason for the departure was given. Rutledge may be contacted at (619) 956-0530 or by EMAIL. SPRING VALLEY (1-10-14)  Mount Miguel Highs DEVAUGHN MURRAY had plenty of choices where he could cast his collegiate future. 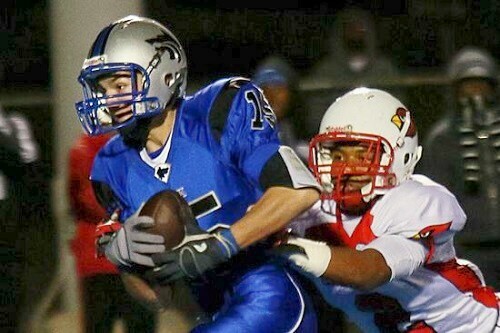 The 6-foot-1, 180-pound safety has committed to San Diego State as part of the Aztecs 2014 recruiting class. Murray, who is listed as a two-star prospect on Rivals.com, chose the Aztecs over UNLV, Colorado State and Utah State. Co-Defensive Player of the Year. He also earned Player of the Year on the defensive side in the Grossmont Valley League. Murray had 13 interceptions over his junior and senior years to set a Mount Miguel career record. He also had 82 tackles during his senior season. Murray played free safety in high school but also lined up at running back and wide receiver, and returned kicks and punts for the Matadors. McDade said that the Matadors' 3-3-5 defensive scheme is similar to SDSU's and that Murray will likely play a free safety type role with the Aztecs, but also has the athleticism to possibly fill in at strong safety. Murray played basketball and ran track for the Matadors during his junior year and plans to run track again this year. Hes a 10.9 sprinter who plans to run the 100 meters, 200 meters and the 4x100 relay. TORRANCE (1-1-14, 3 p.m.)  Christian High School head football coach MATT OLIVER has been named the Califonia state coach of the year in the small schools division, as selected by Cal-Hi Sports. Oliver has had many great seasons in charge of the Patriots but his 15th campaign might have been the best as he led the team to a CIF San Diego Section Division 3 championship despite many distractions and facing larger schools. With a pending court case looming to decide if the Patriots should be allowed to play in a smaller CIF state bowl game division, Christian took care of business and defeated a San Marcos squad that was in the largest class the year. With an enrollment of 380, the Patriots (12-1), who had to face schools with enrollments of over 2,000 to win a section championship (Morse, Hilltop and San Marcos), were hoping to be allowed to be in a lower division for the state bowl games but because of state rules they had to be considered for Division II (same as Chaminade of West Hills) and were not selected. It's not the first section title for Oliver, either. Christian won its previous section crown in 2011 with a win over Santa Fe Christian of Solana Beach. In his 15 seasons, he also has a record of 117-55-2, capped by a 19-7 decision over San Marcos. The last coach from a current CIF San Diego Section school to be chosen as Small Schools Coach of the Year was Bill Wilson of Holtville (12-0) in 1968. The only other San Diego coach on the all-time list for small schools is Glenn Forsythe of Ramona (12-0) for 1958. All-Star game will be held on Saturday (Dec. 28) at 1 p.m. at Helix High School. Tickets are $10 for adults and $5 for students under 18. East County is well represented on the rosters. Two dozen East County athletes will compete in the contest, including Grossmonts record-breaking quarterback ANTHONY LAWRENCE. Other standouts ticketed to compete are Steele Canyon record-breaking wide receiver LAWRENCE DICKENS and Mount Miguel breakaway threat JOVON RICHARDSON. Grossmont quarterback ANTHONY LAWRENCE, offensive lineman CIRWIN SALIH (El Cajon Valley), offensive lineman ALEXIS RAMIREZ (Mount Miguel), offensive lineman JOSE SOLIS (El Cajon Valley), tight end-defensive tackle JUSTIN MITCHELL (Granite Hills), tight end NOAH ORTIZ (West Hills), wide receiver JOVON RICHARDSON (Mount Miguel), wide receiver-kickoff return guy BLAKE DeHAVEN (Granite Hills), wide receiver-kicker J.T. BARNES (Grossmont), wide receiver ALAN HARRIS (El Cajon Valley), linebacker SEAN McCARTHY (Steele Canyon), defensive lineman ROBERT DELOZIER (El Capitan), linebacker ANTHONY ALTON (Grossmont), defensive end THOMAS WHALEN ( El Capitan ) and strong safety CHRISTIAN MENO (Grossmont) will play for the Red All-Stars. Santana offensive lineman MICHAEL VAN BUREN, wide receiver JOHN TODD (Valhalla), running back JESSE BISBAL (Granite Hills), wide receiver LAWRENCE DICKENS (Steele Canyon), linebacker RYDEN KERR (West Hills), defensive end KALVIN WATERS (Grossmont), defensive end KAIAR AL-NAIEM (El Cajon Valley), cornerback ISAIAH EDWARDS (Valhalla), strong safety RYAN LARCEVAL (Steele Canyon), strong safety OWEN BROWN (Santana) will play for the Blue All-Stars. to be held in Alrington, Texas. ARLINGTON, Texas (12-17-13)  Christian High middle linebacker SEBASTIAN SWIFT, a first team All-East County honoree, is among 90 seniors selected to participate in this season's Blue-Grey All-American Bowl, slated for Dec. 22 at AT&T Stadium, home of the Dallas Cowboys. Swift, who helped lead Christian to the San Diego Section Division III championship and a 12-1 record, led East County with 161 tackles and two interceptions. The Blue-Grey organization, which consists of former NFL players giving back to high school students, invites premier athletes to compete at multiple combines throughout the year to earn a position on the Blue-Grey All American team. Swift was one of 90 seniors to be selected as an All-America Bowl Player out of 6,750 participants across the nation. Swift has been contacted by several colleges, but is still undecided. The Blue-Grey All American Bowl will be streamed by the Impact Football Network on a delayed basis on the following day, Dec. 23, at 5 p.m. PT. EL CAJON (12-20-13)  Christian High senior middle linebacker SEBASTIAN SWIFT had a game for the books in the Patriots' 19-7 San Diego CIF Division III conquest of San Marcos to earn the championship trophy. Before the celebration died down, the courts ruled Christian not eligible for state bowl game play. The courts decision did not end Swifts high school career at that point, however. Swift, the Patriots senior captain, is getting some big-time recognition. The Blue-Grey organization, which consists of former NFL players giving back to high school students, invites premier athletes to compete at multiple combines throughout the year to earn a position on the Blue-Grey All-American team. Out of 6,750 nationwide applicants, Swift is being rewarded as one of only 90 seniors selected to participate in the game. AT&T Stadium in Arlington, Texas, is better known as Jerry World after a building molded under the Cowboys' brash owner Jerry Jones. It seats 80,000 and including standing room it can accommodate 105,000 spectators. If that weren't enough it has a Hi-Definition screen that stretches from 20-yard line to 20-yard line. This season Swift led East County with 161 tackles. He sparkled with a dozen tackles, two interceptions, a sack and a fumble recovery in the SDCIF title bout. Some college recruiters are lackadaisically shying away from Swift because of his 6-foot, 205-pound frame, but one look at his resume on film will have them diving for their cell phones. players of the year for the 2013 season. 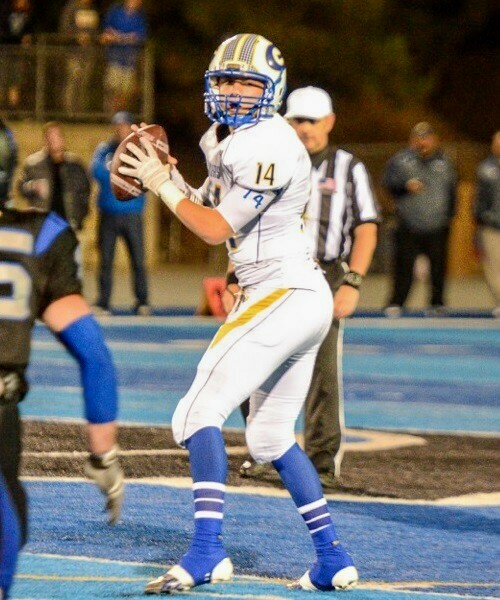 Grossmont senior quarterback ANTHONY LAWRENCE and El Capitan junior quarterback BRAD CAGLE were named All-East County Sports.com Offensive Co-Players of the Year. Lawrence, the San Diego Section all-time career passing leader broke records for passing yards (9,079), completions (691-1099) and touchdown passes (96). He also rushed for 750 career yards and 10 TDs. The versatile field general earned just about every honor an athlete can, including All-State, two-time All-CIF pick, and two-time All-East County Player of the Year. He also holds a 4.29 grade-point average and is being recruited by San Jose State, Yale, UC Davis, Northern Arizona and Fresno State, among others. Cagle completed 147 passes for 2755 yards in 237 attempts. He connected for 32 passing touchdowns and rushed for 11 more and 444 yards. Receiving votes: Christian (22), Carlsbad (20), Rancho Buena Vista (8), Sweetwater (5), San Marcos (5), El Capitan (1), Holtville (1), Imperial (1). A total of 31 sportswriters, sportscasters and CIF representatives from throughout the county vote in the weekly poll. This year's panel includes: John Maffei, Craig Malveaux, Dennis Lin, Don Norcross, Lisa Lane and Andrew Bruer (U-T San Diego), Steve Brand, Terry Monahan, Bill Dickens, Tom Saxe and Rick Hoff (U-T San Diego stringers), Nick Pellegrino (East County Sports.com), Steve Dolan and Rick Hill (107.9 FM/The Mountain), Ernie Martinez (XTRA Sports 1360), John Kentera, Jack Cronin, Ted Mendenhall, Bob Petinak, Jordan Carruth, Bobby Wooldridge and Mark Chlebowski (The Mighty 1090), Rick Willis, Brandon Stone and Jake Fadden (KUSI-TV), Craig Elsten (619sports.net), Rick Smith (Partletonsports.com), Jeff Kurtz (playonsports), Jerry Schniepp, John Labeta (CIF San Diego Section office), Bruce Ward (SD City Schools). The 5-foot-11, 195-pound Cagle was also named the All-EastCountySports.com Most Improved Offensive Player. Other offensive awards went to Helix sophomore offensive lineman FORREST HANLON, who was tabbed the East County Offensive Unsung Hero. Offensive East County Rookie of the Year was awarded to Highlanders sophomore NATE STINSON. All-East County Sports.com Defensive Co-Players of the Year are two-way standouts JALEN DAVIS of Helix and Mount Miguels DEVAUGHN MURRAY. Most Improved on the defensive side is West Hills RYDEN KERR, while Christians SEBASTIAN SWIFT was selected the Defensive Unsung Hero. Valhalla sophomore linebacker LOGAN BAKER was awarded the All-East County Sports.com Defensive Rookie of the Year. East County Sports.com Co-Coach of the Year honors went to Granite Hills second year coach KELLAN COBBS. After a dismal 1-9 finish in his rookie season, Cobbs led the Eagles to a 7-6 record, which is the most victories for a Granite Hills team since 1997. Cobbs shares the award with MATT OLIVER, who guided Christian to a 12-1 mark. Included were consecutive triumphs over Morse, Hilltop and San Marcos to capture the CIF Division 3 championship. The school's record, by the numbers, is the second-best in Patriots history, topped only by the 1978 squad which posted a 9-0-1 ledger (undefeated vs. CIFSDS schools; a scoreless draw at Huntington Beach Brethren). Josh Longbrake (Sr), Jesse Bisbal (Sr). Chandler Rogers (Sr), Peyton Schirman (Sr). Castanos (Sr), Darion Smith (Sr). McManus (Sr), Matt Lipscomb (Sr). Jose Solis (Sr), Matthew Shearin (Jr). Cromwell (Jr), Dillon Rettig (Sr). Jonathan Archibold (Sr), Andres Balbuena (Sr). Bryers (Jr), Tito Ortiz (Jr). Offensive Player of the Year: Clay Bowler (Holtville). Defensive Player of the Year: Luis Martinez (Crawford). First-team offense: Clay Bowler (Holtville) Sr.; Joel Hermosillo (Vincent Memorial) Sr.; Ray Lyons (Crawford) Sr.; Musa Musa (Crawford) Sr.; Josh Lee (Mountain Empire) Jr.; David Lucero (Holtville) Sr.; Baulio Ruiz (Crawford) Jr.; Justin Saunders (Mountain Empire) Sr.; Juan Manuel Ochoa (Vincent Memorial) Sr.; Joseph Singh (Holtville) Sr.; Lance Angullo (Holtville) Sr.
Second-team offense: Daniel Palma (Vincent Memorial) Sr.; Kyler Chumbley (Escondido Charter) Sr.; Brandon Thai (Crawford) Sr.; Brendan Gabriel (Crawford) Sr.; Josh Osuna (Holtville) Sr.; Mutula Kwangaba (Escondido Charter) So. ; Troy Clark (Mountain Empire) Sr.; Edgar Chavez (Crawford) Sr.; Aaron Chabolla (Calipatria); Danny Serratos (Mountain Empire) Jr.; Collin Hoyt (Holtville) So. First-team defense: DaShane Mahoney (Crawford) Sr.; David Lucero (Holtville) Sr.; Abdi Musa (Crawford) Sr.; Luis Martinez (Crawford) Sr.; Tyler Hickey (Holtville) Sr.; Jesse Sawyer (Mountain Empire) Sr.; Courteney Roberts (Crawford) Sr.; Troy Clark (Mountain Empire) Sr.; Lance Angullo (Holtville) Sr.; Skye Atondo (Calipatria); Diego Cruz (Crawford) Sr.
Second-team defense: Brendan Gabriel (Crawford) Sr.; Nate Mata (Calipatria); Jeff Calhoun (Holtville) Sr.; Vaughny Opel (Mountain Empire) Sr.; Sonec Tan (Crawford) Jr,; Ernesto Araujo (Vincent Memorial) Jr.; Keven Reynoso (Holtville) Sr.; Larry Hollingsworth (Mountain Empire) Sr.; David Castillo (Escondido Charter) Jr.; Marco Cueva (Vincent Memorial) Jr.; Josh Seo (Escondido Charter) So. CIF San Diego Section Player of the Year on Offense. Player of the Year from Imperial Co.
BALBOA PARK (12-6-13)  For the first time since the CIF San Diego Secton was created in 1960, a student-athlete from Imperial County has been named the Player of the Year in football. Imperial High senior Royce Freeman, who established a new career rushing record in the section, was voted the honor as the top player from all six divisions combined. The voting was by members of the media and selected coaches under the auspices of the San Diego Hall of Champions. Freeman, who eanred a scholarship to Oregon, powered the Tigers to a perfect 10-0 mark during the regular season to capture the Imperial Valley League title, then defeated El Capitan in the Division 2 quarterfinals, 49-42, before falling to St. Augustine in the semifinals, 56-12. Freemam rushed for 218 yards and three touchdowns against the Vaqueros, then 175 more against the Saints, finishing with 7,605 yards, easily eclipsing the mark set by Escondido's Ricky Seales (6,694 in 2006-09). 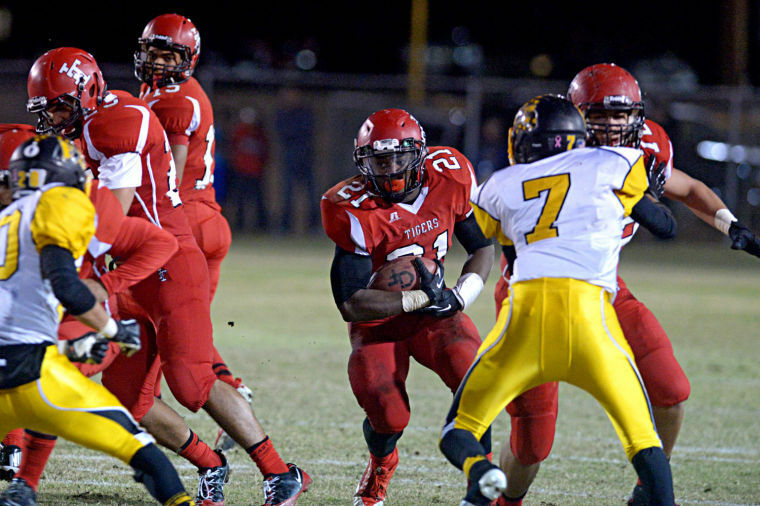 Freeman also set the CIFSDS career standard with 111 touchdowns. On defense, the Player of the Year was Mission Hills linebacker Fred Warner, who led the Grizzlies to their first-ever CIF championship in four title game appearances, caqpturing the inaugural Open Division. Six East County players were noted to this year's team, including Helix defensive back JALEN DAVIS, the lone honoree on defense. On offense, CIFSDS career passing leader ANTHONY LAWRENCE of Grossmont was tabbed as best quarterback, while BRAD CAGLE of El Capitan also gained a first-team berth. Other first-team selections were Helix lineman JALEN WYATT, Grossmont wide receiver CHRISTIAN BROOKS, and West Hills kicker DANIEL McMANUS. which combines all six divisions.